Each fall, Historic Rugby residents gather in the village’s Laurel Dale Cemetery to share the stories of some of Rugby’s most colorful characters of the last 135 years. 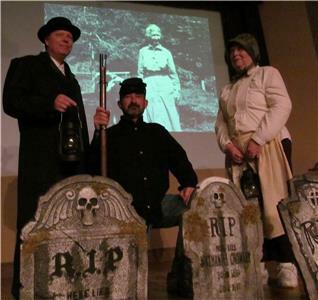 On March 26, Historic Rugby will produce a special stage version of the Lantern Tour in Historic Rugby’s Rebecca Johnson Theater. This will provide an opportunity for more people to see the Lantern Tour (because the Fall cemetery version is held on sacred ground, the audience is limited to 40). And it will add a new dimension to the show, with slides of historic photos complementing the costumed presenters’ words. The most recent version of Historic Rugby’s unique Lantern Tour unveiled several new characters from Rugby’s past. This version adds yet another new voice. Hear in her own words from the widow left to complete construction of Rugby’s library. There’s also the lady who rode a white horse, came to Rugby to dance and remained for 50 years. Listen to a lad who grew up here in the 1885-1900 years and find out how he helped honor Queen Victoria in British-founded Rugby. Those and others now dearly departed tell their tales. They speak for themselves in words taken from letters, diaries, newspaper accounts and interviews. The event begins at 4:30 pm Eastern (3:30 Central). Tickets are $10 and because of the popularity of this event, reservations are recommended. Call 423-628-2441 to reserve or for lodging information. The Harrow Road Café is closed for renovation, so picnics are encouraged. Rugby, founded in 1880 as a British-American utopian village, is just off State Scenic Hwy. 52, sixteen miles southeast of Jamestown and 35 miles from either Interstate 40 or I-75 in western East Tennessee. To learn more, visit historicrugby.org.